Arsenal are considering a long list of names to replace Arsene Wenger this summer but a key battle at the moment seems to be between two top candidates. The Gunners found out this week that Wenger would be stepping down as manager at the end of the season, bringing to an end a memorable 22 years in charge of the club. 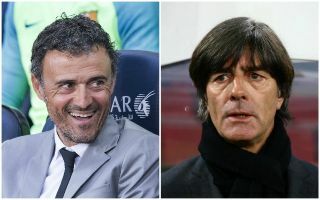 It will now take a big name indeed to come in and carry on Wenger’s fine work, and it looks as though it’s likely to be between Luis Enrique and Joachim Low for the job. At the moment, former Barcelona manager Enrique may be edging it against Low for four main reasons, according to the Daily Mail. Firstly, the Spanish tactician is available straight away, unlike Low who must complete this summer’s World Cup with his role as manager of the German national team. Secondly, Arsenal are aware of how Enrique took a somewhat deflated Barcelona squad in the summer of 2014 and rejuvenated them back to their highest level – a similar task that would await him at the Emirates Stadium. Third, Enrique is highly regarded for the way he improved Barca’s fitness levels, and fourthly for his tactical setup, which looks needed after a somewhat relaxed approach from Wenger in that department in recent times. Many Arsenal fans will question if Enrique’s stint at the Nou Camp is really any preparation for a much harder job awaiting him at Arsenal, but he at least has top-level club experience, unlike Low who has been in charge of Germany since 2006.